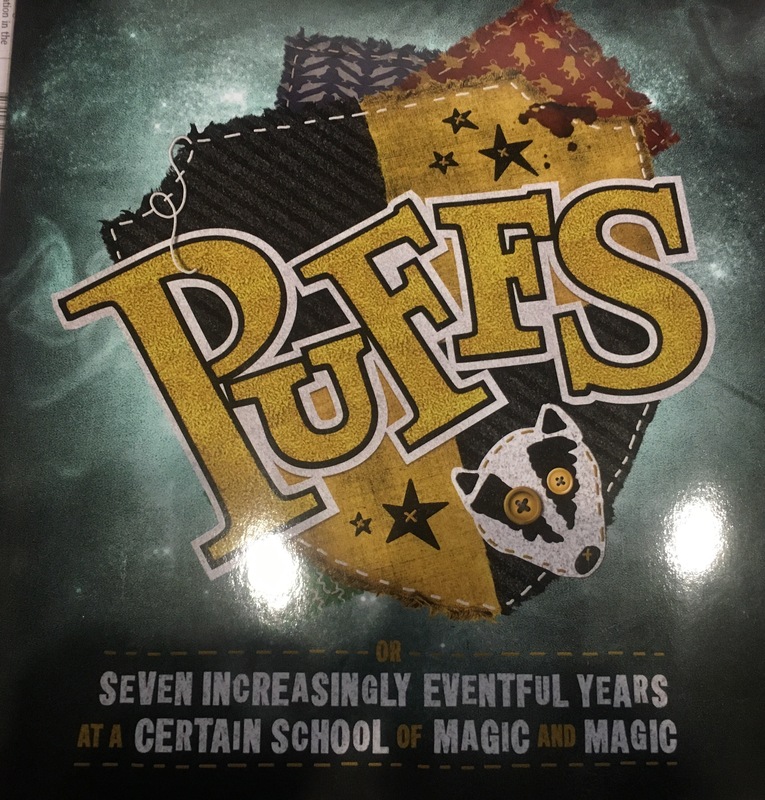 Puffs (also know as ‘Seven Increasingly Eventful Years at a Certain School of Magic & Magic’) is a play written by Matt Cox, and the production is currently in town at the Alex Theatre in St Kilda. Dressed in my full Slytherin house outfit, a friend and I joined the throng of assorted witches, wizards and muggles ready to watch the show. I was impressed that the Alex Theatre has gone ‘all out’ with their theming, with witty signs and decorations festooning the foyer and indeed the theatre which just ramped up my excitement. You see, being a fan of a certain franchise can be tough when the Northern Hemisphere gets the bounty of special events. We are so lucky to have Puffs in Melbourne – let me tell you why via my review below! Let me start by mentioning I did have my reservations about this play: were they doing the franchise so dear to my heart justice? Had they done the requisite character research? Was it to be too focused on Hufflepuff house for my Slytherin tastes? I need not have worried about any of that as “Puffs” was suitably true to the books and entertaining for light readers right through to devotees. Indeed the audience may not have even needed to read all of the source material in order to enjoy the performance. A large spread of age ranges in the audience was testament to its broad appeal. The story of “Puffs” centres around Wayne (from Craigieburn!) and the mixed (Bertie Botts eat your heart out!) bag of friends he makes along the way in Puffs house. Puffs house members are known for not being an assortment of adjectives (book smart; sneaky ; brave) but this play proves they are endearing, friendly, clever and entertaining. Each character had a ‘type’ (the ’emotional one’, the ‘sporty one’, the ‘good at maths one’, the ‘confused one’) which brought charm and an assortment of giggles along the storyline. The narrator of the play drove the progression of events along all seven books in a clever manner, with a ‘swish and a flick’ of comedic flair. The stage setup of an assortment of doors was also used in a variety of clever ways by the cast. I was particularly impressed with how poignant Hufflepuff scenes from the books were translated on stage, and the inclusion of stage magic in others scenes (wands included!). There were an assortment of modern / muggle references and puns which gained some extra hearty laughs from the audience. At one point I had to muffle my laughing (that had turned to crying) with my Slytherin scarf. All the characters you know and love are referenced (including ‘the boy who lived’,’you-know-who’ and some favourite professors). A memorable scene was the description of how the heads of house decided on who would be accepted at the school, which was enhanced with the use of a variety of props. In fact, much of this show was prop heavy which suited the comedic nature of the show. Going into the play, I had no idea what to expect however be assured that this show will make you laugh (probably a handful of times!). Such was the amount of comedy and laughs, I was surprised that this show hadn’t visited the city during the comedy festival. ‘Puffs’ is a magical night out, which suits a large range of ages (do note that they offer matinees for younger witches and wizards). Those who have not read the books relating to the franchise need not be put off as there are laughs and references included with a wide appeal. The subject material is treated well and the cast is aware that much of their audience has an extensive working knowledge of the texts. This all means that the show is by no means a cheesy parody, it delivers on all aspects of content (time permitting of course) and respect for the source material. VERDICT: Accio wand and broom and get ready for an express ride through the ‘Seven Increasingly Eventful Years at a Certain School of Magic & Magic’,filled to the brim of a pointy hat with puns, hearty laughs and hilarious moments. It’s nice that members of Puffs finally have their time in the sun, and it’s true that this show is an enjoyable one- no matter what house you’re in.